Preheat your Yoder Smokers YS640 to 375ºF. To impart additional smoke flavor, fill an A-MAZE-N Tube Smoker with your favorite pellets, light with a torch and place on the cooking grate, off to the side. Combine the beef, bread crumbs and eggs and mix well by hand. Form the meat mixture into 1/2 - 3/4 oz balls. Season the meatballs with Plowboys Yardbird Rub. Wrap 1/3-1/2 a slice of bacon around each meatball and secure with a toothpick. Transfer the meatballs to the grill. Combine two parts Plowboys Sweet 180 BBQ Sauce with one part ChiliDawg’s Razbanero Spread. Whisk to combine (you may need to warm the mixture in the microwave). 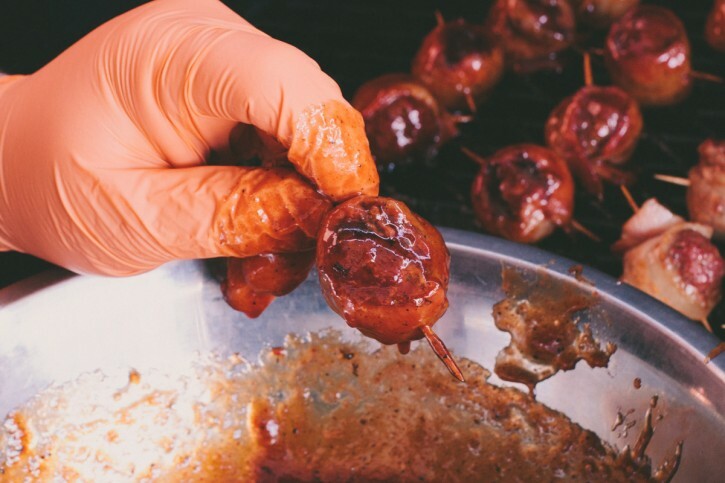 When the moink balls reach an internal temperature of 140ºF dip them in the bbq sauce mixture and return them to the grate. Continue cooking until the internal temperature reaches 165ºF. Total cooking time is roughly 30 minutes. Serve warm. 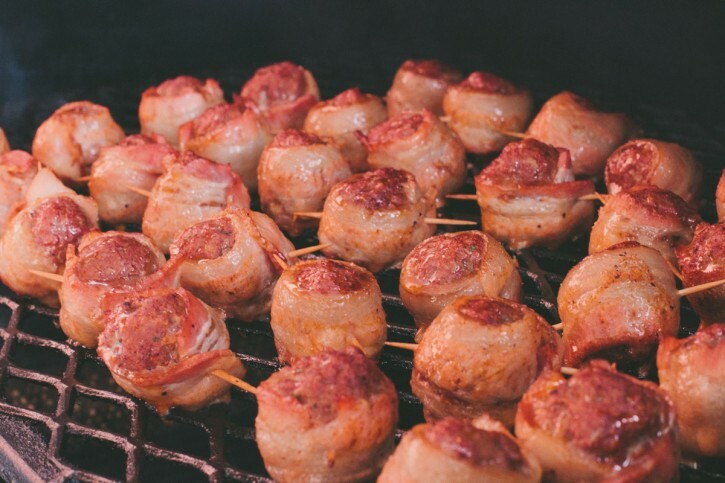 Moink balls (that’s “moo” and “oink”) are beef meatballs wrapped in bacon. 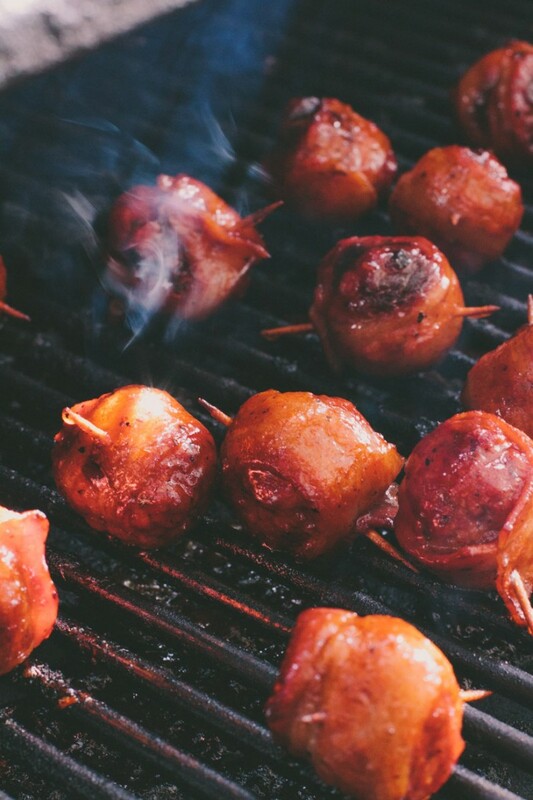 If there is one BBQ appetizer that you need to know about, it’s the moink ball. It’s beef, it’s pork, it’s awesome! The great thing about moink balls is that despite their simplicity there are endless ways in which they can be prepared. You’ll probably never run out of combinations of rubs and sauces for seasoning your moink balls, though you’ll likely find your favorites as you continue to experiment. The other great thing about moink balls is that you can put as much or little into the preparation as you want. You could grind your own beef and make your own meatball. You could even cure and smoke your own bacon. 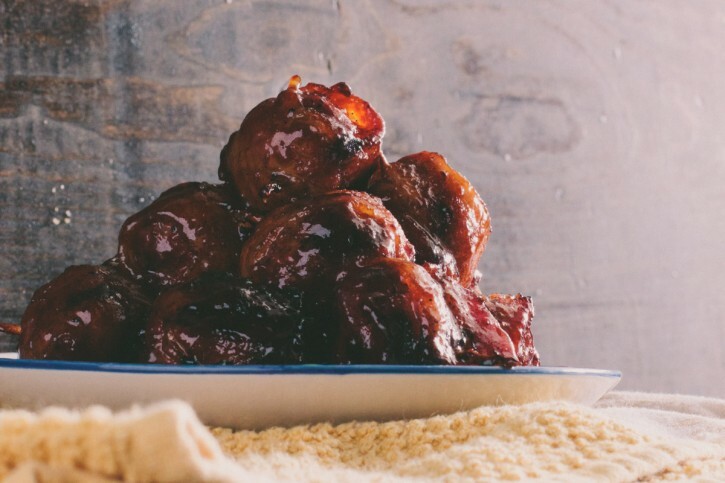 Or on the opposite end of the spectrum, you could buy frozen meatballs from the grocery store, wrap them in bacon and throw them on the grill. This recipe calls for making your meatball from scratch, using store bought ground beef. We think the extra effort involved in making the meatball from scratch is really worth it in the end.